In my childhood I held a strong fascination for flowers, for their beauty, geometry, simplicity. I observed them, I admired them, I drew them. I tried to understand what made them the way they were, what gave them this ‘something indescribable’. Later I found the same ‘something’ in bigger pictures, in landscapes, in stars & clouds, in peoples’ faces. That invisible ‘something’ that orders the visible in harmonic beauty. I’ve always been in deep awe of that power, and discovering it in myself gave a strong direction to my personal and artistic journey. and to remind others, that it’s everywhere, inside & outside, available to everybody. spreading & sharing it to my best conscience with the world. 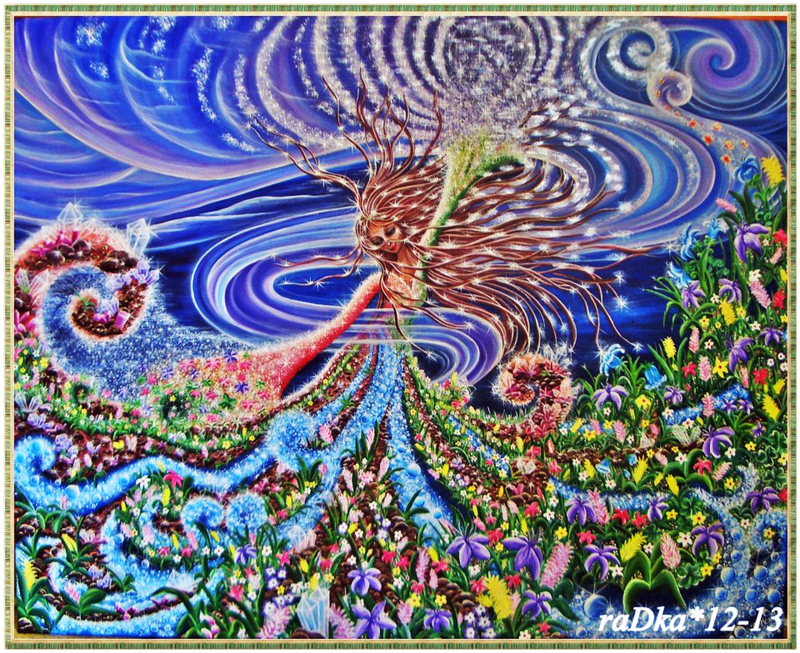 Born in the communist era in Czechoslovakia, being half Czech and half Slovak, Radka’s childhood was influenced by both the Czech part that gave her beautiful fairytales, castles and landscapes of wild meadows, forests and rivers, and the slovak one, that tought her the traditional folklore handicrafts. In her twenties she followed the calling of her heart for a community of rebels, gypsies, artists and dreamers, and lived many years in Germany, partly travelling and exploring the world, especially Asia and central America. Nowdays she settled on the Canary Islands in the Atlantic Ocean. The beauty and power of the volcanic nature support immensely her creativity, and help her find what she searched most – her inner peace, and a fulfilling life of authentic expression.